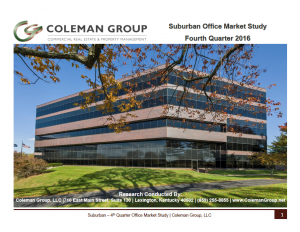 Coleman Group » Fourth Quarter 2016 Suburban Market Study Available Now! Fourth Quarter 2016 Suburban Market Study Available Now! The Coleman Group is pleased to offer this in-depth analysis of the Suburban market in Lexington, Kentucky. This study is produced on an annual basis and is the most detailed study made publicly available in the region.